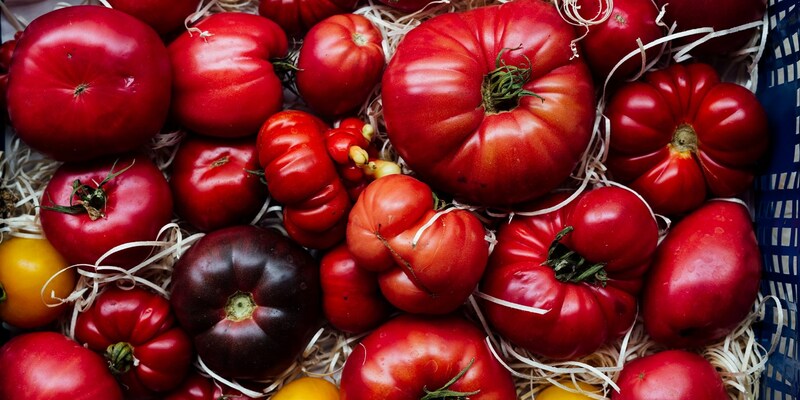 Big or small, fresh or tinned, cooked or raw, tomatoes are among the hardest workers in the fruit and vegetable world, forming an integral part of countless dishes from cuisines all over the world. Tomatoes of all varieties are increasingly available throughout the year, but British tomato season proper usually begins in the spring and runs until around October – keep an eye out for heritage (also known as heirloom) tomatoes, too, which boast a stunning flavour to counter their often misshapen appearance. Browse our colourful collection of tomato recipes for both classic dishes and some brand new inspiration. Tomatoes are simmered with chilli and spices in Anna Hansen's Turkish menemen recipe, while Robert Thompson uses an elegant ceviche-style tomato salad as the base for his charred mackerel fillet. There are plenty of tomato soup recipes to be found, too – try Adam Gray's healthy tomato soup recipe, or James Mackenzie's Tomato gazpacho with mozzarella salad for a refreshing summery alternative. Paul Ainsworth's fiery Arrabiata sauce recipe would pair perfectly with pasta, while Andy Water's creates a tomato and olive sauce for his baked cod recipe.